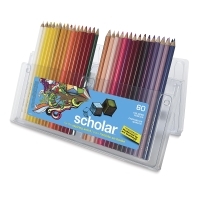 Scholar is a quality line of student pencils from the makers of Prismacolor Colored Pencils, the best-selling artist colored pencil. 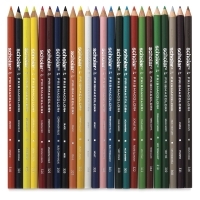 Recommended by professional artists and art educators for their richly pigmented color and unmatched blendability, Prismacolor Scholar Art Pencils open up brilliant new possibilities for visual learning and creative expression. 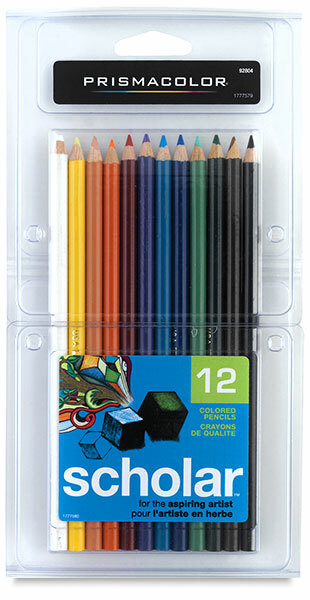 The pencils feature a creamy texture and strong, thick cores that minimize breakage, perfect for the developing artist. They’re ideal for a variety of uses, including idea development, sketching, creating realistic drawings, and mixed media. 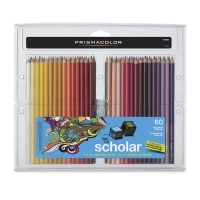 Prismacolor Scholar Art Pencils are made from non-rainforest wood and can be used in combination with Prismacolor Art Markers. 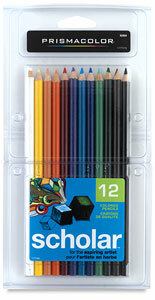 Class Pack, Set of 288 — This set contains 24 each of 12 colors and six free pencil sharpeners. Portable and easy to clean, the pencil sharpeners feature steel blades that gently sharpen your Prismacolor Scholar Colored Pencils to a fine point. Class Pack, Set of 576 — This set contains 24 each of 24 colors and 12 free pencil sharpeners. Portable and easy to clean, the pencil sharpeners feature steel blades that gently sharpen your Prismacolor Scholar Colored Pencils to a fine point. 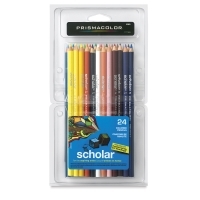 Set of 60 — This set contains one each of every color in the Scholar Art Pencils line including: White (x2), Cream, Neon Yellow, Lemon Yellow, Canary Yellow, Yellow Ochre, Orange Yellow, Orange Ochre, Deep Orange, Neon Orange, Orange, Vermillion Red, Scarlet Red, Carmine Red, Crimson Red, Pink, Peach, Light Peach, Light Pink, Neon Pink, Fuchsia, Magenta, Crimson Lake, Tuscan Red, Purple, Orchid, Light Violet, Mauve, Lavender, Violet, Indigo Blue, Porcelaine Blue, Copenhagen Blue, Light Blue, Sky Blue, Cloud Blue, Permanent Blue, Aquamarine, Light Green, Peacock Green, Permanent Green, Pale Green, Neon Green, Yellow Chartreuse, Grass Green, Dark Green, Olive Green, Avocado Green, Terra Cotta, Sienna, Dark Brown, Raw Umber, Pale Cold Gray, Dark Gray, Medium Cold Gray, Pale Warm Gray, Silver, and Black (x2). Set of 48 — This set contains one each of the following colors: White, Cream, Neon Yellow, Lemon Yellow, Canary Yellow, Yellow Ochre, Orange, Vermillion Red, Scarlet Red, Carmine Red, Peach, Light Peach, Light Pink, Neon Pink, Magenta, Crimson Lake, Purple, Light Violet, Mauve, Lavender, Violet, Indigo Blue, Porcelaine Blue, Copenhagen Blue, Light Blue, Cloud Blue, Permanent Blue, Aquamarine, Light Green, Peacock Green, Permanent Green, Pale Green, Grass Green, Dark Green, Olive Green, Terra Cotta, Sienna, Dark Brown, Pale Cold Gray, Dark Gray, Medium Cold Gray, Silver, Gold, and Black. Set of 12 — This set contains one each of the following colors: White, Lemon Yellow, Orange, Peach, Crimson Lake, Violet, Copenhagen Blue, Permanent Blue, Permanent Green, Dark Green, Dark Brown, and Black. Set of 24 — This set contains one each of the following colors: White, Neon Yellow, Lemon Yellow, Canary Yellow, Orange, Scarlet Red, Carmine Red, Peach, Light Pink, Crimson Lake, Purple, Violet, Copenhagen Blue, Permanent Blue, Aquamarine, Permanent Green, Pale Green, Grass Green, Dark Green, Terra Cotta, Dark Brown, Pale Cold Gray, and Black.